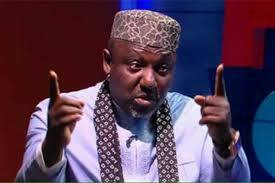 President Muhammadu Buhari will win in the South-East in 2019 – Okorocha – Royal Times of Nigeria. 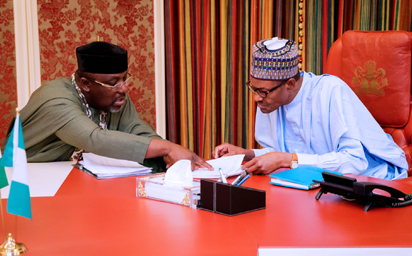 President Buhari receives in audience Governor Rochas Okorochas of Imo State. The governor also said that President Muhammadu Buhari will win in the South-East in 2019 for his second tenure, adding that the Igbos have come to realize and appreciate the fact that the best politics they can play in 2019 is voting for Buhari. Governor Okorocha spoke weekend at a dinner organized for what was tagged “emerging leaders and aspirants in the South-East for Buhari,” at the Imo International Convention Centre (IICC) Owerri, explaining that he does not have any personal score to settle with any minister or leader from the South-East, but his interest at the moment is to ensure that the Igbos would never allow the political mistake of 2015 to repeat itself in 2019. The governor also regretted that Igbo leaders prefer to live in Abuja and leaving the younger politicians with nobody to fall back on at home unlike their contemporaries in the North and West. His stated “On the home front, there is no goal keeper. All our leaders live in Abuja, even former governors. All our leaders are in Abuja and there is no one to fall back on at home unlike our contemporaries in the North and West. Muhammadu Buhari is the President but Shehu Shageri is in Sokoto. Ibrahim Babangida is in Minna, Abdulsalami Abubakar is also in Minna. Obasanjo is in ota, Ogun State. Bola Tinubu is in Lagos. They are goal keepers and elder statesmen to their younger ones and giving support to their future generation, “But for us, our case is different. Our old politicians keep rocking back and front, usurping the political future of our younger generation. So, I am of the firm belief that we should have a new and virile Igbo nation so that the younger ones can begin to take their rightful positions. That’s what we mean by emerging leaders and not that you are not leaders in your own rights”, he stated. The governor charged all those who have ambition for elective positions in APC in the South-East to start coming out and should not withhold such ambition or aspiration for any reason, adding that APC won’t leave any stone unturned now in the South-East. His words, “We have made advanced preparations for the mega rallies for Buhari to go round the Eastern states beginning with Ebonyi State. We are poised to position our people for national politics. South East for Buhari is on rescue mission and we shall be in Ebony, Abia, Enugu and Anambra. We have come to correct history. By 2019, the Igbo history will be re-written”.